When I saw his chef’s hat, I did a double take. It was a networking event hosted at Tangerine a couple of years ago and I’d been having more fun tasting chef-owner Alec Schuler’s antipasti spread than making small-talk with strangers. As I recall, it was the squid that that sent me over the moon…thick and tender with lemon, garlic, olive oil, butter, and basil. Tangerine’s breakfast space was being used for the evening networking event, and the food emerged from the Arugula kitchen next door. So why the double take? I’ve never had the chance to talk with the creative artist behind my food. It felt like a celebrity sighting. How many restaurants do you frequent where the chef emerges from the kitchen to inquire about your experience? I polled some friends on Facebook and got names of three Boulder restaurants, but since I believe it’s rare, I was inspired to bring them out for you here. For those who can imagine the passion, creativity, hard work, and unique personality required to be a successful chef these days, enjoy this first of an ongoing series to learn how your favorite chefs tick, and how they landed at (or created) your favorite Boulder restaurants. Alec Schuler was raised on Long Island by an English mother and Swiss German father. Mediterranean cooking dominated his mother’s cooking style. In 2001 Alec graduated from the Natural Gourmet Institute in Manhattan, where he studied macrobiotic, Ayurveda and other alternative cooking styles, and where no beef was ever cooked. He developed his true culinary skills elsewhere, but the focus on healthy food reflected in his cooking likely originated with these early influences. In Boulder, Alec has launched three contiguous venues (Arugula, Amaro, and Tangerine) that complement each other and that truly offer “something for everyone”. Truly innovative and healthy interpretations using the best of Italian and local ingredients. Of note: First Bite Monday every night: Three-course meal for $26/pp. Wine Wednesdays: 40% off any bottle of wine all night. Happy hour 4:30-6:00 every day, featuring 22 small plates priced between $4-$7. Extensive menu & daily specials offering items ranging from Hawaiian Parrot fish, cioppino, and rack of lamb to creative salads and other vegetarian and gluten-free options. EDB: When did you open in Boulder? EDB: Restaurant life before Boulder? EDB: What was your favorite food as a kid? EDB: What was the first meal you made that you were proud of? My mom used to call me the little gourmet, because by age seven I used to make myself after school snacks, like a plate with melted cheese toast, sliced ham, pickles, nuts, etc. EDB: What inspired you to become a chef? I love restaurants and wanted to understand every aspect of the business so I could open my own. EDB: Who was your most important mentor, and why? Christian Potvin from Vannes, France. This was the first real kitchen job I had (in 2001) and he was a world class French chef, yet we cooked together in a small French Bistro (Au Bouchon) in Seattle. We were the only two people who cooked in that restaurant, so I learned how to do everything from him. His mother is Spanish (from Valencia) so it was a nice mix of classic French and Mediterranean Spanish. Then when he moved to a new restaurant (Mr. Lucky—a high end club with a great restaurant) I went with him, so I got to see another aspect of his style. EDB: Do you follow chefs all over the world and if so, what media do you use most to discover what’s they’re doing? I don’t. I sort of have this mentality that if I don’t keep up on “the scene” then I will stay original. All my creativity comes from my experiences eating in restaurants and people’s homes, from all cultures and cuisines, from all over the world. And I combine that with what I like to eat, and my style. EDB: What other creative talents do you have? Life, Qigong, playtime with my two sons, and creative exploration of the local mountains on bike, skis, and by foot. EDB: What two adjectives describe your cuisine? EDB: What is your favorite ingredient? EDB: Now or in the past, have you been well known for a ‘signature’ dish? At Arugula, it would be my calamari dishes, mushroom dishes, sausage & goat cheese pasta, and tomato-fennel bisque. EDB: What are three local ingredients that you source religiously? EDB: What is one really exotic ingredient that’s hard to procure but when you get it, you can’t wait to try it out in new recipes? Western slope peaches or garlic scapes or squash blossoms. All highly seasonal and local. EDB: What are two “house made” items you create in your kitchen that many restaurants don’t? The bar is so high in Boulder, so not sure. 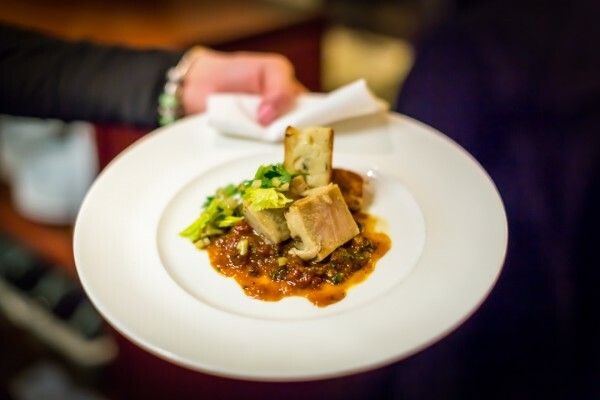 But on our current menu is braised local pork belly, and our crackers. EDB: Have you won any local or national awards for your Boulder restaurant(s)? The American Culinary Federation gives awards for each state; in 2011 we were given the 2011 Colorado Culinary Award of Excellence. They only award four per year, so I’m really proud of this one. And in 2012 I received the Daily Camera’s Boulder County Gold award for Best Chef. 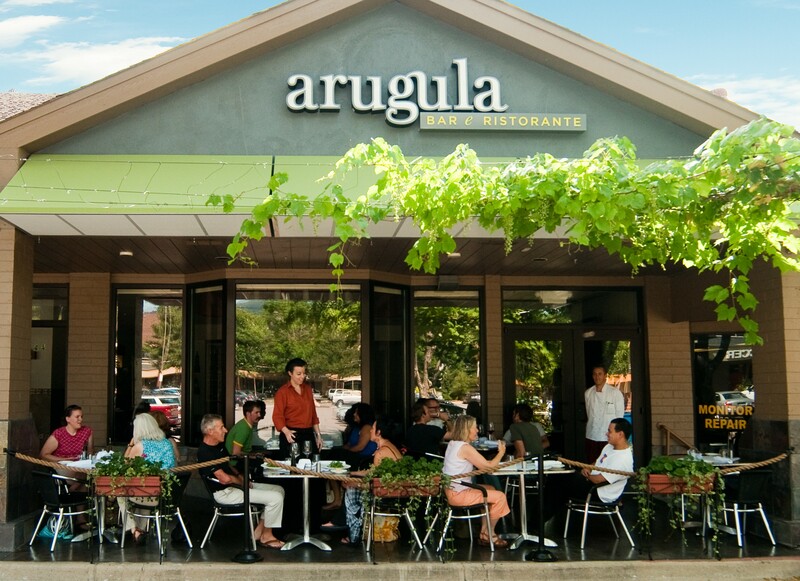 Also, in 2009, Arugula was named as one of 5280 Magazine’s top new restaurants that year. EDB: What music do you like to hear when you cook? EDB: What kitchen utensil is most important to you? EDB: What do you most value in a sous-chef? The ability to communicate quickly and thoroughly. EDB: What is your favorite hangover meal? Corned beef hash at Tangerine. EDB: What is your favorite midnight snack? Terrestrial Protein (pork, chicken, beef). EDB: What most satisfies your sweet tooth? EDB: Whom do you most like to cook for? EDB: If the nation’s most famous food critic came to eat at your restaurant, what would you serve him/her? EDB: What one food would you take with you on a desert island? EDB: What would you eat at your last meal, if you could plan such a thing? Rice, egg yolk, soy sauce. EDB: If you could have one other career, what would it be? A tour guide of places I love. EDB: What food trend would you most like to erase from the annals of history? EDB: What was the most memorable food trend in Boulder in 2012, and what do you predict will stay or become prominent in 2013? EDB: What do you most want Boulder area customers to know about your restaurant and/or your food? It’s the real thing, served fresh, 100% from scratch, nothing processed. The healthy attributes of all foods are considered in all preparations, and we use extra virgin first press olive oil for the majority of fat in both restaurants. We do veggies really well. A greasy-spoon meal. Not for me! Author’s Note: This interview has been edited from and some of the interview questions were inspired by a chef interview in a past issue of Edible Marin. Really enjoyed reading this! Another gem by Ms. Powell. And I like the question choice; really says a lot about the chef. Bravo, not Stronzo! Onions! Who would have thunk it?! Great article, Beth. I’ve got to check out the small plates at Amaro…..
I’m game if you want to convene a group!